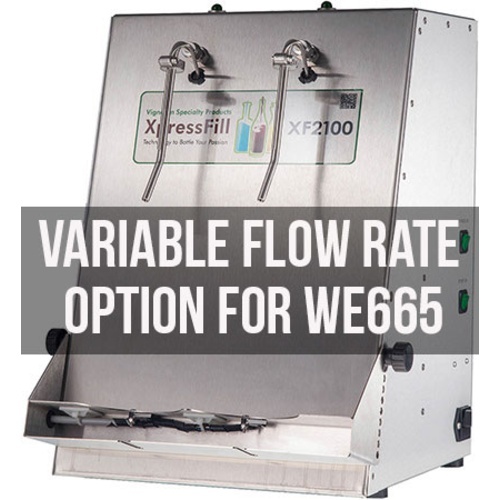 Xpress Fill Level Filler - 2 Spout Variable Flow Rate Option The Variable Flow Control Option for the XF2100 Level Filler from XpressFill is an optional feature that can be purchased at the same time as the filler. This option allows you to speed up or slow down the rate at which the bottles are filled based on the needs/capabilities of your production line, as well as those of your product. This option also boosts the fill rate to a whopping 400 bottles per hour! Features special fill nozzles to eliminate foaming of the wine as it is filled to reduce oxidation and the amount of time that the filler is recovering from foaming and performing top off.